Red Sox manager Alex Cora, one of the team’s championship trophies and a bystander have been hit by errant beer cans thrown during the team’s victory lap through downtown Boston. The 19-year-old Sandwich, Massachusetts, resident was charged with disorderly conduct and assault. The Boston Globe reports Connolly said he didn’t mean to hit Cora, who wasn’t seriously hurt. The newspaper said a 20-year-old parade goer suffered a gash on her nose from another thrown beer. Team spokeswoman Zineb Curran declined to comment, other than to say the incidents were unfortunate but didn’t appear intentional. She says the World Series trophy would easily be repaired. Police say 19-year-old Patrick Connolly, of Sandwich, was charged with disorderly conduct and assault and battery with a dangerous weapon. They say it struck but didn’t injure an unidentified man aboard one of the amphibious duck boats carrying players and their families in Wednesday’s parade. It wasn’t immediately clear if the beer can Connolly allegedly threw was the same can that hit and damaged a World Series trophy, or if the man it hit was a ballplayer. Hundreds of thousands of jubilant fans turned out for the procession through downtown Boston to celebrate the fourth Red Sox championship title in 15 years. Boston’s euphoric street party celebrating the city’s fourth World Series title in 15 years is winding down. Security was heavy for Wednesday’s duck boat parade carrying the victorious Red Sox through downtown. Police reported no arrests or incidents, but a fan reportedly tossed a full can of beer at one of the boats, and it struck and slightly damaged a World Series trophy. Hundreds of thousands of jubilant fans skipped school and work to cheer for the team, giving this year’s Halloween a special flavor on a crisp autumn day. Many wore Red Sox gear instead of Halloween costumes. Members of the World Series championship Boston Red Sox are taking turns hoisting the trophy, triggering deafening cheers from adoring fans. Hundreds of thousands of people lined a parade route Wednesday for a glimpse of their favorite players riding in the city’s iconic amphibious duck boats. Confetti rained down on the crowds, who screamed their approval and snapped selfies as the procession wound its way through downtown Boston. Players autographed balls and tossed them into the cheering throng. Security was tight along the route, which took the team past the site of the deadly 2013 Boston Marathon bombings. Authorities had not reported any arrests or incidents as of midday. The Red Sox beat the Los Angeles Dodgers 5-1 in Sunday’s Game 5 to win their fourth World Series title in 15 years. Boston is celebrating a not-so-spooky Halloween as the city gleefully cheers its fourth World Series title in 15 years. Red Sox caps, jerseys and jackets are the favored costumes as hundreds of thousands line the streets downtown for a duck boat parade honoring the championship team. Jarrick Fidalgo, of New Bedford, was one of many taking advantage of the fact that Wednesday’s parade fell on Halloween. He wore a Sox jersey and ski hat, but also had his face painted up like the Joker from “Batman.” Fidalgo says it’s his first championship celebration. The Red Sox beat the Los Angeles Dodgers 5-1 in Sunday’s Game 5 to win their latest title. Bits of red, white and blue paper are raining down on fans who have been packing downtown streets on a crisp autumn morning for a glimpse of the ballplayers riding the city’s emblematic amphibious duck boats. The players and members of their families are waving down from the open-roofed vehicles. Security is heavy for Wednesday’s celebratory parade, with uniformed police officers lining the route and plainclothes officers mingling with the crowds. Fans are decked out in Red Sox gear, and many have been making anti-Yankees chants, reflecting the fierce and long-running sports rivalry between Boston and New York. The Red Sox won their fourth championship in the past 15 years with a 5-1 win Sunday over the Los Angeles Dodgers in Game 5. Sports fans grown accustomed to the success of their beloved teams are lining the streets in the hundreds of thousands to salute the Boston Red Sox on their fourth championship in the last 15 years. 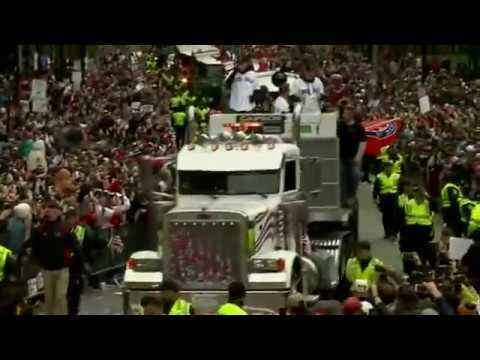 Wednesday’s parade began at venerable Fenway Park and was winding along several major downtown streets. Players, coaches and team officials climbed aboard amphibious duck boats to show off the team’s latest World Series trophy, secured Sunday with a 5-1 win over the Los Angeles Dodgers in Game 5.